Full hands-on analysis, competitive landscape survey, high resolution photographs, full specifications and price. Magnificently executed World Time watch, taking the elements from the traditional and famous Patek Philippe World Time watches, and updated with a modern aesthetic and modern mechanics. 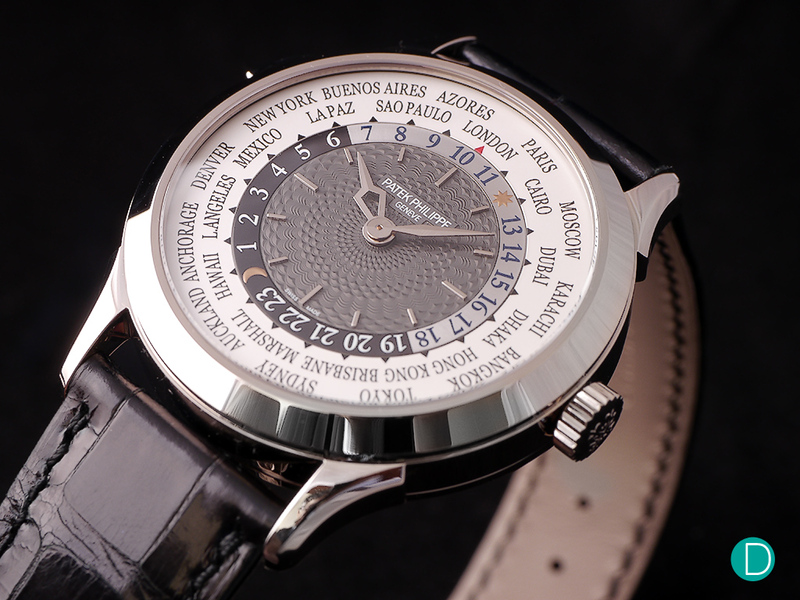 A simpler (which is sometimes a positive) alternative to the Patek Philippe Ref. 5930 World Time Chronograph, which is the crème de la crème. 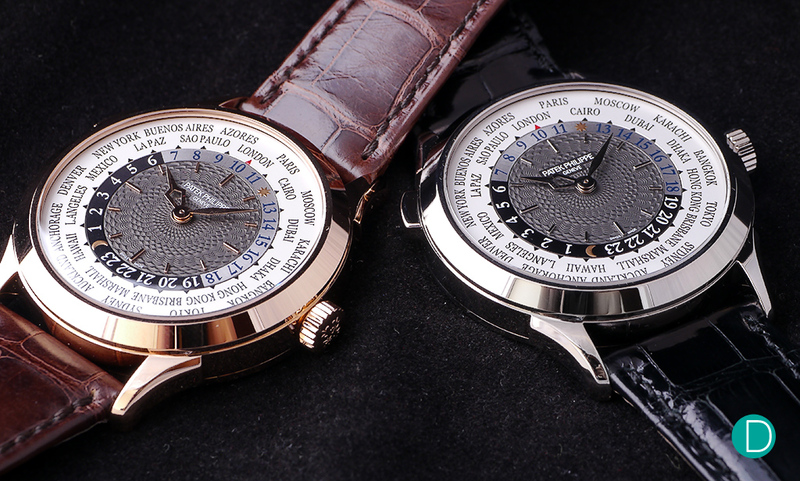 This Baselworld, Patek Philippe announced a double whammy for World Time watches. We already reviewed the Patek Philippe Ref. 5930 World Time Chronograph, and now we bring you our hands-on analysis on the simpler Patek Philippe Ref. 5230 World Time. Patek Philippe is a brand revered for its watchmaking savoir faire and record breaking auction performances in the secondary market. And they are particularly well known for achieving some incredible prices on their enamel dialed watches, their chronographs and perpetual calendars and tourbillons, but also their World Time watches. Patek began working with Louis Cottier, using his patented method to display the timezones across the globe in the 1930s, and have continued to keep one World Time reference for most years in their catalog since. The latest series, with the Ref. 5930 and the Ref. 5230 are the latest in this direction. In white gold, the Patek Philippe 5230. The monotone look is particularly appealing in that though it oozes class and quality as Patek watches tend to do, it remains quiet, dignified and understated. To describe the Ref. 5230 as a simpler brother to the Ref. 5930 is accurate, but seems to do the 5230 a dis-service. On the surface, the 5230 looks like the 5930 with the chronograph stripped, but it is more than that. Way more. Indeed on the dial side, other than the styling on the guilloché medallion at the center of the dial, the only tell tale sign is the lack of a center seconds hand and the chronograph pushers. But the basis for both these watches cannot be more different. The 5930 is based on Patek’s chronograph, and the 5230 on Patek’s thin automatic, though both are fitted with the same world time module. The hands are perhaps the other big difference between the two Pateks. In the 5930, they are Dauphine shaped with Luminova. On the 5230, the hands are in a more traditional World Time fashion. The hour hand is designed with stylized “Southern Cross” constellation motif. It is pierced with lapped flanks. And the minute hand is Lozenge-shaped minute hand with lapped flanks. The dial detail on the 5230. The center guilloché medallion looks like its done in relief, and reminds the author of the scales of a crocodile’s back. 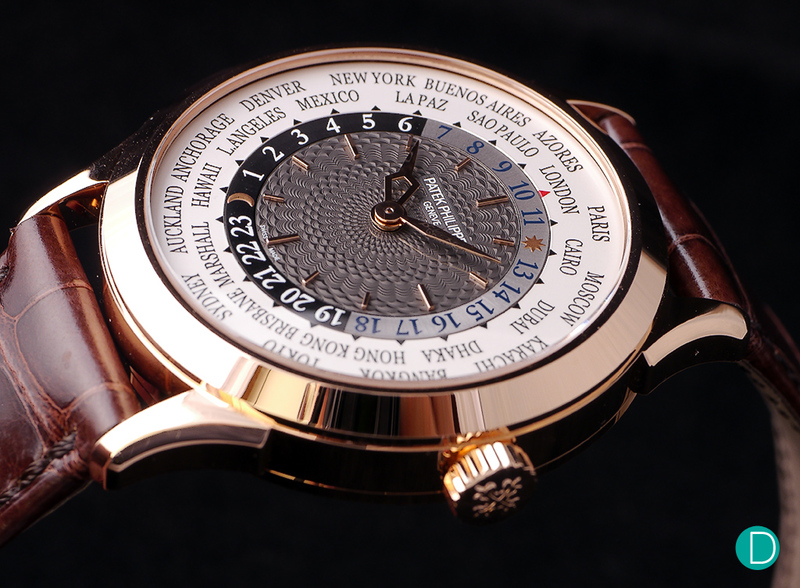 The dial’s guilloché on the center medallion is quite interesting. The overall effect is as if it is done in a relief style, although it is not. The guilloché is executed by hand on a rose engine, and is quite traditional. But the image which comes to the author’s mind when looking at the pattern is of the resulting scars of the skin cutting rituals of the Kaningara Tribe in Papua New Guinea. The ritual is a rite of passage into adulthood for Kaningara boys as they cross the threshold to adulthood, and is intended to look like the scales of a crocodile’s back. We doubt this was the intent of the Patek guilloché experts as they worked on the dial, but result is a piece of art which a permanent part of the dial as are the scars on the body of the tribesmen. In red gold, the Patek Ref. 5230 is decidedly less understated than its white gold alternate. The rose gold case creates a somewhat more romantic feel to the watch. Otherwise, the dial and the functions are very similar to the 5930, and 24 time zones are indicated. Moscow’s timezone is updated, and Dubai instead of Riyadh and Brisbane instead of Nouméa is used as these are the important modern cities than the ones they replaced. And as usual, execution is top grade. Patek Caliber 240 HU. HU stands for Heure Universelle, meaning universal time. While the 5930 was based on the C.28-250 chronograph caliber, the 5230 is based on the C.240. The C.240 is a classic Patek ultra thin automatic caliber with micro rotor. 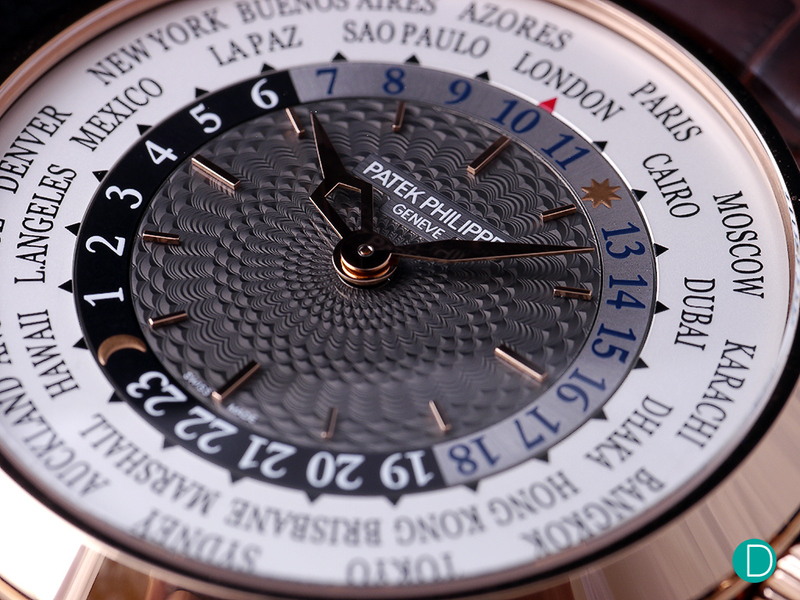 We find this base movement one of the most desirable among the automatic movements in the Patek Philippe collection. The movement is beautifully designed, with nice flowing bridges, and the magnificent micro-rotor offering a center point to fixate (yes fixate) one’s eyes on. Another high visual point is the beautiful Gyromax equipped balance wheel. 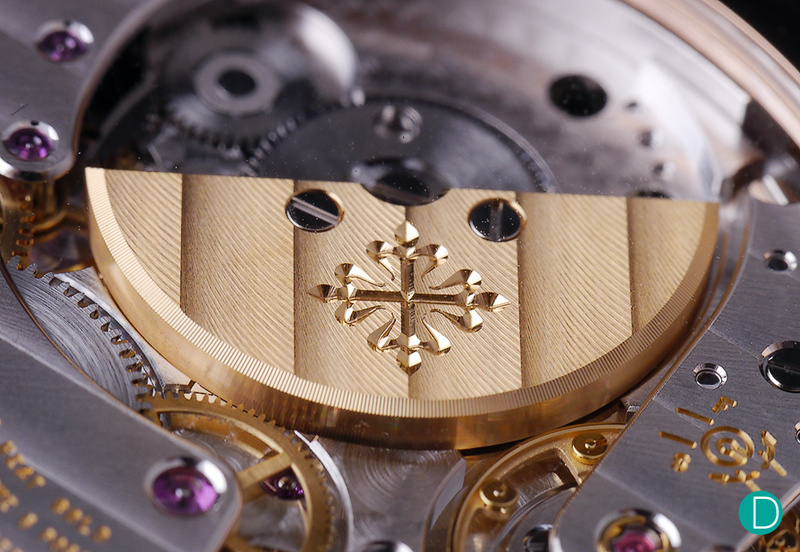 The rotor, bearing an engraving of the Calatrava Cross which Patek Philippe uses as a logo. 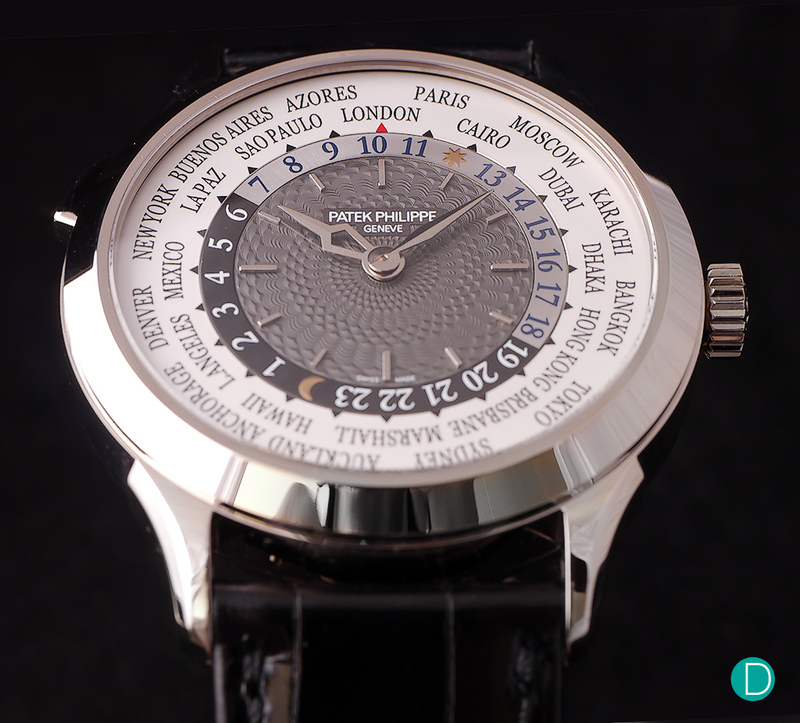 The execution is exquisite, and in line with Patek Philippe standards. 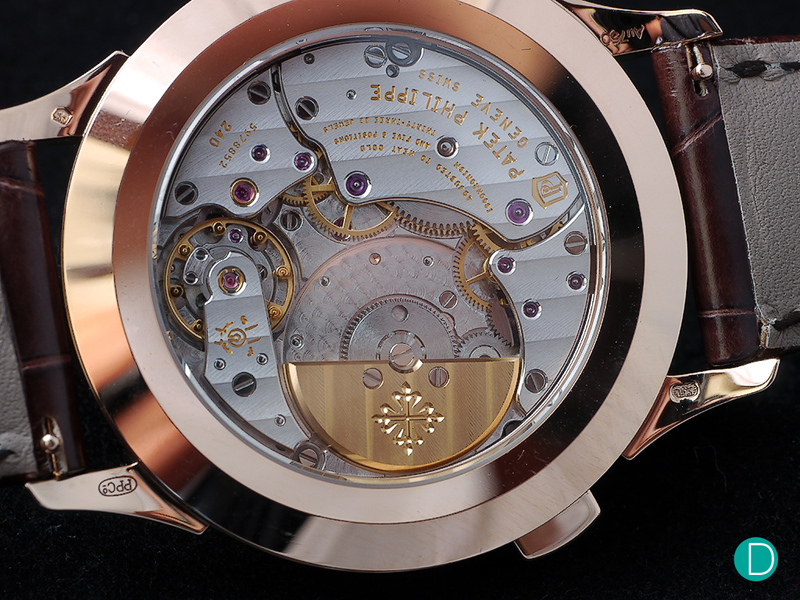 The movement is certified with the Patek Philippe Seal. Movement finishing is beautiful. The anglage, Côtes de Genève, and perlage are all executed par excellence. If we had a nit to pick, it would be the on the design of the bridges. The edges on all the bridges are are rounded, and do not feature any inward or outward angles. The only outward angles we can identify on the movement is on the base plate holding the arbor of the center (canon) pinion, where 3 outward angles are observed. These, of course are executed very well. But we would have loved to see the bridges feature some of these outward and inward angles. Movement finishing is exquisite. The anglage and Côtes de Genève are very well executed. Priced at US$47,600 before taxes (approx S$65,300 or CHF 47,000), the Patek 5230 makes a good case of itself in comparison to possible World Time watches. Another view of the Patek 5230 in rose gold. The Andersen Genève Tempus Terrae (CHF 48,600 for red gold, and CHF 46,800 for white gold) is similarly priced. The Andersen is built on the same Cottier model, and the overall look and feel of the watch is largely similar. 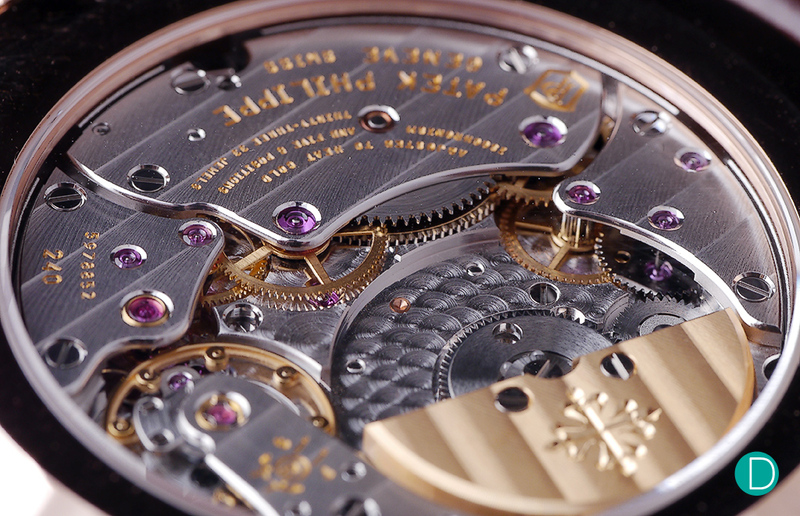 But the devil is in the details, and the experience and expertise of Patek shows. The 5230 is altogether more refined, and has a certain je ne sais quoi in the movement finish that the Andersen totally lacks. The beauty of the C.240 HU and the finish quality is a true spectacle. The Tempus Terrae is finished to an engineering level and lacks the innate beauty of a haute horlogerie movement. It is built on an outsourced movement (Anderson does not tell what is the base, but it looks rather basic ETA styled movement), upgraded by Sven Andersen for the World Time. The Andersen is limited to 25 pieces in each metal, and the Patek is limited only by production, but the Andersen will never achieve the same value in the secondary market as a Patek. And this makes the 5230’s value look remarkable for the similar asking price. A more worthy opponent might be the Vacheron Constantin Overseas World Time (S$ 56,900 in a stainless steel case incl GST. This converts to CHF 37,800). The pedigree is similar. Patek Philippe and Vacheron Constantin are the grande dames of watchmaking, at the very top of the game. The VC C.2460 WT is a worthy match for the C.240 HU. Build quality and finishing are within the same ball park. But the VC Overseas is designed with a stainless steel case and has a water resistance rating of 150m, and by virtue of the steel case is more robust. It also comes with a stainless steel bracelet, a crocodile strap and a rubber strap with an ingenious system of changing them. 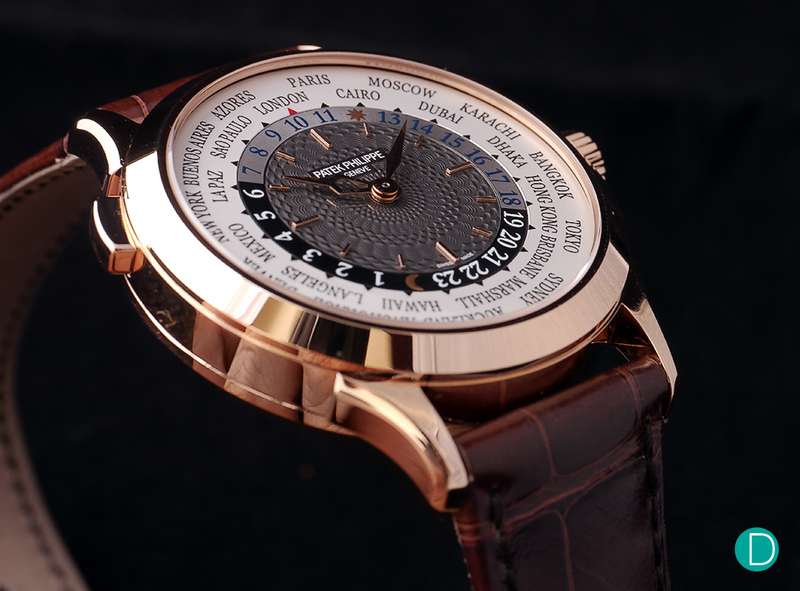 In addition, the VC shows 37 cities ‘ timezones versus Patek’s 24. The Patek 5230 is only available in precious metal, and the approximately CHF 10,000 premium easily justifies the change in case material. It is impossible to decide which is better, as neither is. And both are very competitive in features, functions, pedigree and price. The edge, again goes to Patek if resale prices come into play, as historically Pateks tend to receive better secondary market prices than VC. Patek Philippe Ref. 5230 World Time in white gold. The Patek Philippe Ref. 5230 World Time is a very special watch. Well, one can argue that all Pateks are special, and it of the view of this author that Patek makes beautiful watches, but the 5230 is exceptionally so. 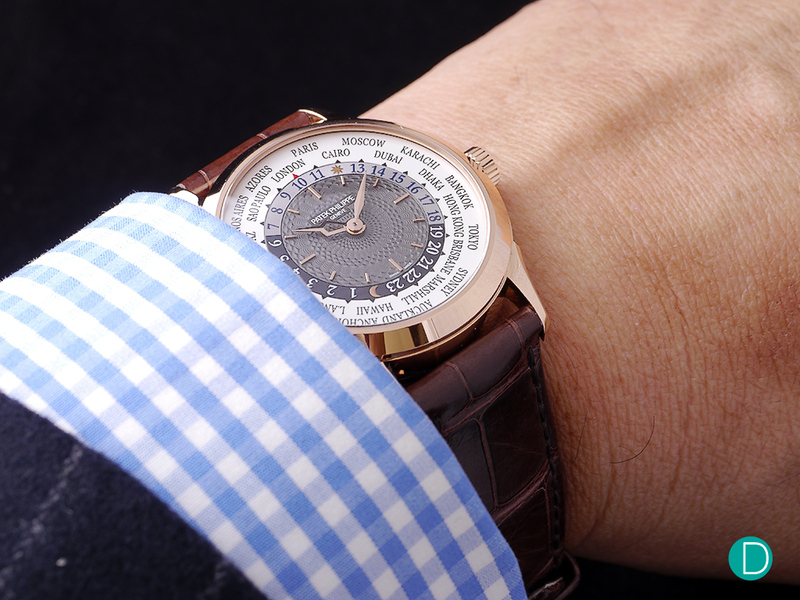 It makes the Patek World Time experience more accessible to the general collector public. Priced at US$47,600, it is a rather reasonable value, if half a hundred grand can be a reasonable ransom. Great World Time watch for the frequent traveler, especially for business people who need to know the actual times at various offices around the world in a single glance. Superlative watch, which is likely to stand the test of time and auctions. On the wrist the 38.5mm case diameter is perfect. Comfortable, and easily slipping under the cuffs and ready for the boardroom. Anywhere in the world. Patek Philippe Ref 5230 World Time. Available in rose gold and white gold.